Today we have been to visit Colin’s parents as they have returned from 3 weeks in Tenerife, during which time it was Barbara’s birthday- we had not got our act together in time to give her a present before she left so today we made up for it. 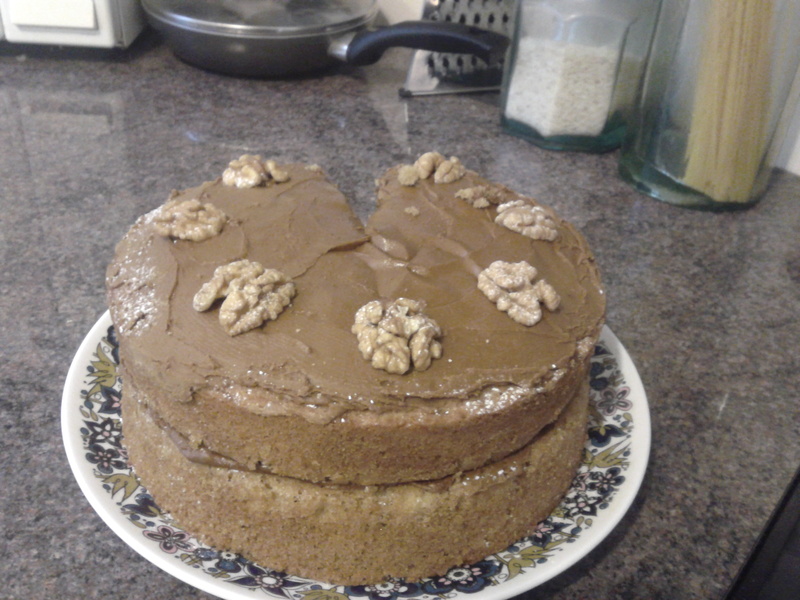 She had made a coffee and walnut cake which tasted as good as it looks, quite rich though so you can only have small piece at a time! Looking back through the week to bring us up to date. Wednesday I had a recipe in mind from a new book on meatballs but I got in a little later than expected and so opted for a simpler version. I simply seasoned beef mince with salt & pepper and added 1 tbsp ras-al-hanout, then shaped them into small balls and baked them in the oven for 20 mins until cooked through and browned. In a saute pan I fried a small, chopped onion with a little garlic in olive oil until soft. I added 2 tins of tomatoes and cooked down for 20 mins. I then added half a small tin of coconut cream and 2 small, hot red chillis and simmered for another 10 mins. I added the meatballs just before serving. The wedges were pretty good and crispy. I just cut some big potatoes into wedges, tossed in a little olive, salt, cumin and paprika and baked in the oven until the potatoes were cooked through and crispy. On Thursday I was working late night so no dinner for me. Colin had the majestic meal of fish fingers, chips and beans! Tonight we have been out for a very good meal at A Cena in Richmond. Look at the Restaurant page for a review! We hadn’t made a ‘normal’ curry for a while- and by ‘normal’ I mean what we used to think of as normal= a chicken curry! heat a little oil and fry the garlic, ginger, cumin, mustard and curry leaves for 1 min. Add the chicken and stir until browned. Remove from the pan. add a little more oil if the pan is dry. Add the paprika, turmeric and garam masala and combine to a paste- you can add a little water to make the paste if it is a little dry. add the onions and fry until softened. Add the peppers and fry for 5 mins. Add the chicken back to the pan and stir to combine. add the tomatoes and leave to simmer for 30 mins until thickened. stir in the lemon juice just before serving and season with salt & pepper. When we were last at Wholefoods we bought some very thinly sliced pancetta which I’d almost forgotten about, so before it reached the end of it’s life it became dinner! Tonight was a simple pasta dish after long days at work for both of us. I sliced the pancetta into strips and sauteed in a pan, without any oil as the fat from the pancetta was sufficient. I added a little chopped garlic and a small chopped chilli for a minute or 2 before adding 2 tins of tomatoes, seasoning, and I left it to bubble away until thick- about 40 mins I think. We had this with some pasta shells- a breakthrough with Colin as he thought he didn’t like them! Nice and comforting and we went to bed with happy full tums. A relaxing day off today and a really lovely lunch of eggs poached in a spicy, Turkish style tomatoey sauce. Not Colin’s cup of tea so I often have this on my day off when he’s a work! I think I might have to enrol on a food photography course as you will see from the following picture of dinner! I bet you can’t even guess what this was!!! 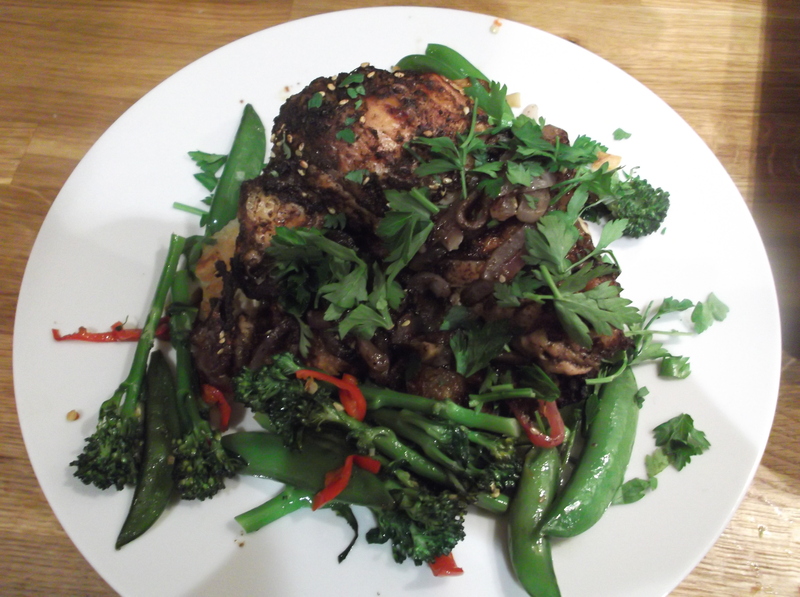 Well, dinner was a marinated, grilled chicken with latkes and broccoli with chilli. The chicken pieces were marinaded through the day in 1 tbsp olive oil, 1 tbsp lemon juice, 1 tsp paprika, 1 tsp ground cumin, and some salt & pepper. I then put it on a baking sheet, sprinkled over some za’tar and grilled in the oven for 30 mins until crispy. The broccoili is from the first Ottolenghi book and it is delicious. You can blanch the broccoli first but I bought some slender stem broccoil so this wasn’t necessary. I heated a little olive oil and when hot threw in a chopped garlic clove and 1 hot, sliced, red chilli. I stirred this for a couple of seconds and then added the broccoli, sprinkled with a little water. I stirred this for only 5 mins of so until the broccoli was a bright green, slightly softened but still nice and crunchy. 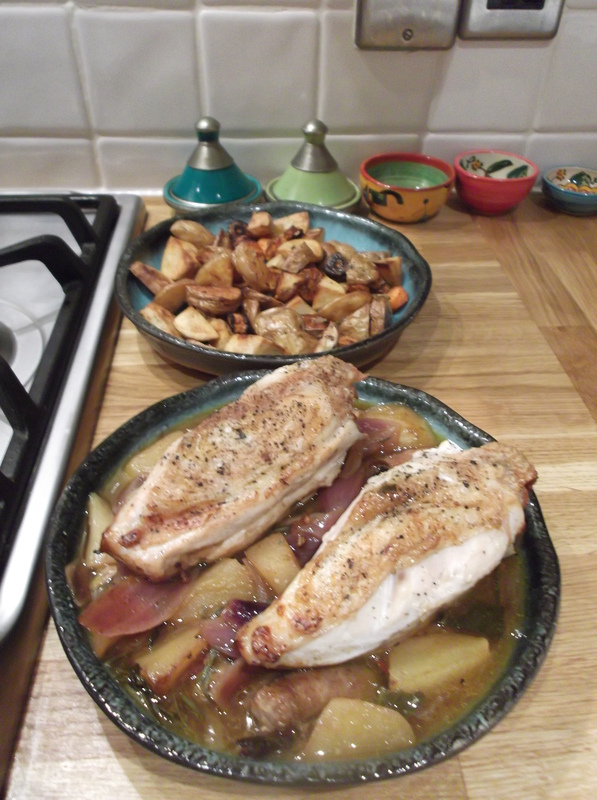 This was a lovely dinner, all gobbled up, definitely better than my photography suggests! We had some lovely looking sea bass fillets in for the fish counter this morning so I decided to do some pan-fried fish for dinner. Not a brilliant picture- I can assure you it tasted alot better that it looks! The bass was simply seasoned and pan fried in a little olive oil, skin side first, until crispy. It is sat on top of a spicy sauce of tomatoes and roasted red peppers. 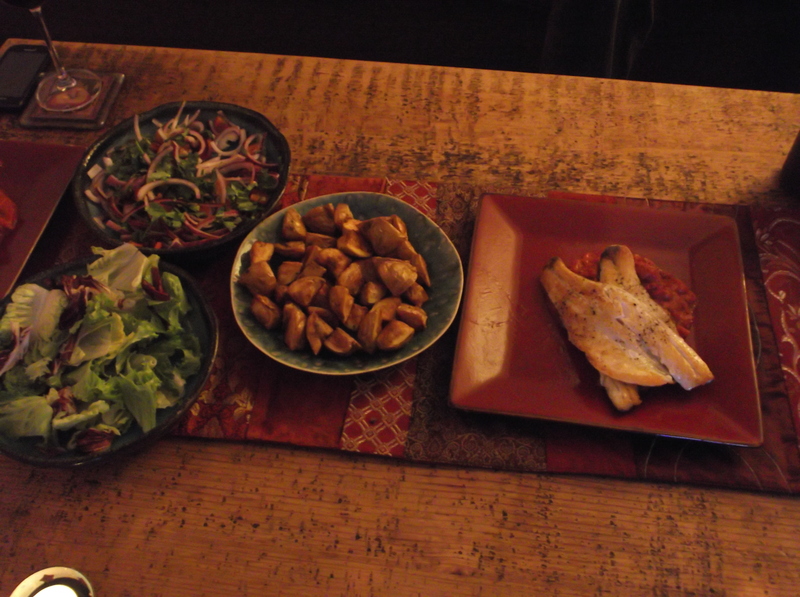 On the side some little roasted potatoes, crispy salad leaves and a red onion, tomato, coriander and lemon juice salad. A nice, fresh and light dinner after a busy day. It’s been my day off today so I am feeling relaxed and in the mood for cooking! 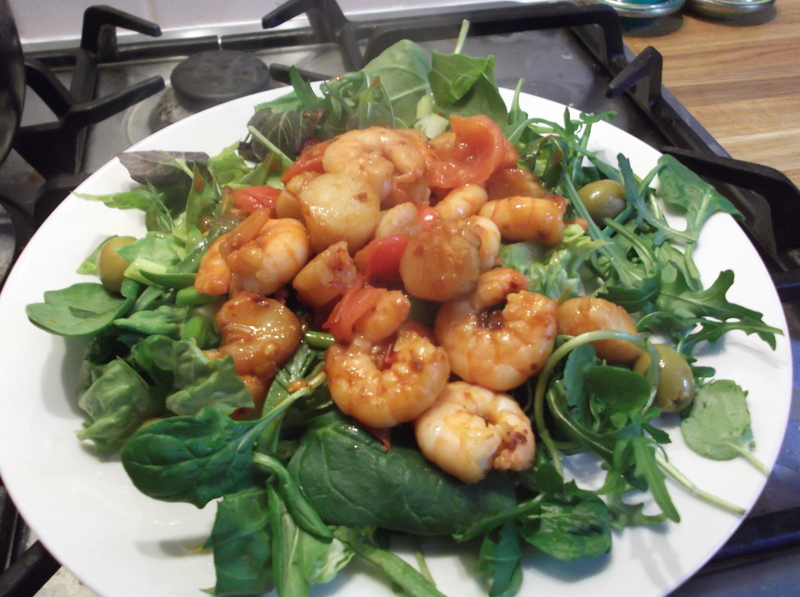 After the gym and the shopping trip I was definitely hungry so an old favourite for lunch- seafood salad. I make many different versions of this but today I used some prawns and mini scallops. I begin by adding a tbsp harissa paste to a frying pan and swirl around for a minute. I then add the seafood and stir fry until cooked through. Before throwing on top some salad leaves I give it a good squeeze of lemon juice, a little salt and pepper and then eat it very quickly! For dinner I made a variation of a Lorraine Pascale recipe for chicken which went down very well and will become a regular feature on the French Thomas dinner table. Here’s the recipe. heat some olive oil in a saute pan, season the chicken and brown on both sides. Remove from the pan. Do the same with the sausages. fry the red onion with the garlic for a couple of minutes until softened. Add the herbs and apples and saute for a minute of two. Return the chicken and sausages to the pan. Add the cider and bring it to a boil. Turn down, cover the pan, and pop in the oven for 30 mins. After 20 mins cooking time take the lid off the pan so that the chicken browns up nicely and the sauce reduces a little. We ate this with some quarters of potato tossed with a little olive oil and roasted in the oven for the same time as the casserole. 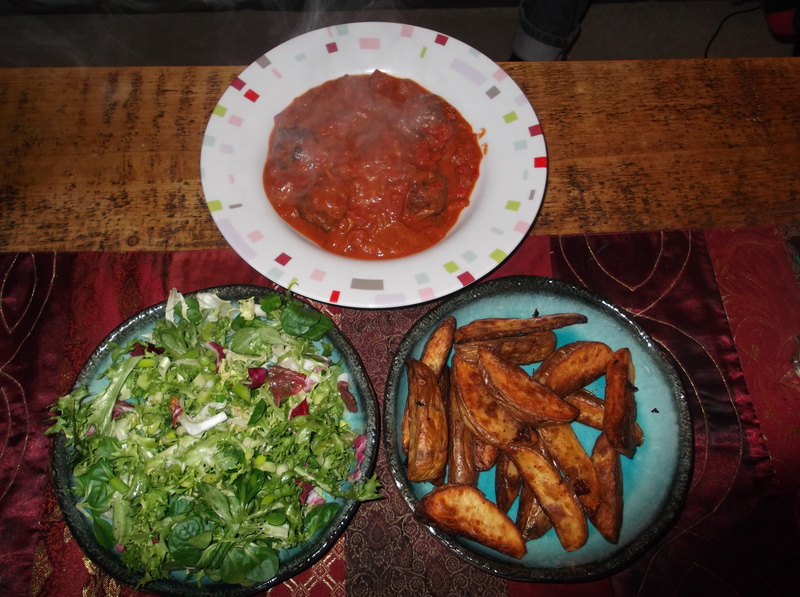 It was all very tasty, the sausages really add a layer of flavour which makes the dish come together. The apple becomes soft and almost savoury- delicious! Friday is my late night so no dinner- boo hoo!